Returning from the midnight showing of The Hunger Games, I check my Facebook & my twitter. It seems like everyone is agog over it, but I'm not. Here I've organized my rant about why I'm displeased with this movie adaptation. (***I tried to avoid spoilers for those of you who haven't seen it yet***). First off-- I don't actually consider The Hunger Games one of my favorite books. In fact, I anticipated liking the movie more than the book because it would make everything more visual for me. Wrong, wrong, wrong. In other words, Katniss is on the verge of tears more often, more alive in her interactions with Gale, less awkward when it comes to interacting with people. On one level, this makes me like her a bit more--she's less paranoid over Peeta's intentions, more receptive to the idea of trusting someone; she's friendlier and nicer, doesn't snap at Peeta like she does in the book. On the other hand, I hate that. I'm not even a staunch advocate of the books, and you've made Katniss less manipulative, less paranoid, less stubborn--less of herself. You've also taken away the power of Rue's death by making her more emotional, since Rue's death was one of the only times she actually lets herself feel what she does, but in the movies, that's not the case. I understand that you have to show Katniss in some pain--how else could movie goers identify with her? She can't be too strong--but if you want us to identify with her more, show more of her little struggles, like the one for water (see later point for imbalance in time portioning). Also, from the start, Katniss says she's smart in the movie, but then the directors took away some of her ideas and made others point out things to her. This refers to #1 in part because I feel like they made Katniss "more feminine" and Peeta "more masculine" in order to make them more accessible. Peeta develops an astounding ability to fight. Yeah, he must have done decently when he went up against Cato the first time, so he must not be too bad, but it's less of Katniss saving the both of them so much as them saving each other. Peeta's not awkward in the woods; he's smarter and Katniss worries about him less... until the one scene when she says, "Damn you! You scared me!" and hugs and doesn't let go... as opposed to the Katniss who struggles with her feelings and shouts at him because she's not sure why she's upset. No, this Katniss is the woman who needs comfort from her man. This Katniss is less independent than book Katniss. Rue's death & the berry scene. The berry scene was like 5 minutes total, which is absolutely ridiculous! because it is the focus of the books! What did Katniss mean? Did she secretly want to oppose the Capitol? What about Peeta? What about everyone identifying with the two of them in that moment? Besides, they didn't even carry out their bluff, which made the Capitol less scary and more willing to acquiesce to the demands of these two lowly tributes (vs. being forced into it). 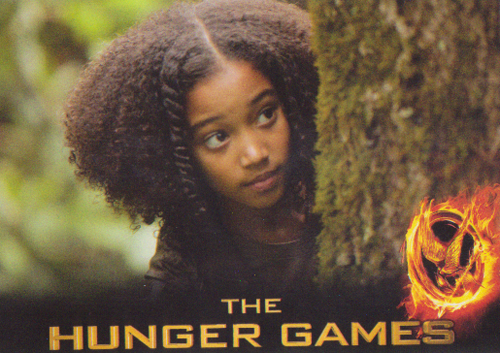 Rue's death. My God. That was my favorite scene in the book. I don't understand why it was necessary to change that. 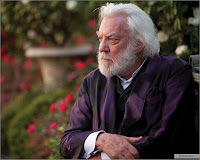 The book scene emphasizes the tragedy of the Hunger Games--that Katniss is too late to save her friend, that it's her first kill and this is what the Capitol makes them all do. It also makes her more selfless than what they chose to do in the movie, which is way more instinctual and reflexive than tragic. There are a lot of scenes in the beginning that I felt could be shortened to make room for scenes at the end. The beginning was way more anticlimactic (and I kept thinking, will you hurry up? Why can't we have more focus on the games themselves than this stuff?) than the end, with the berry scene. In fact, the movie ended kind of abruptly. Less of a cycle where Katniss wakes up alone and is almost alone at the end. I won't mention how it ends but suffice it to say that it focuses less on Katniss and doesn't have that same cyclical effect / mirroring of themes. "I watched you every day." Nooooooo! You just turned Peeta into a stalker! They also chose not to have it as one-sided as before--I can understand that; the movie makers would probably want Katniss to fall in love with Peeta and not make him desperately in love with her and her manipulative and whatnot... But then there are moments when they gaze longingly at one another and with the line I already mentioned, I couldn't help but be reminded of a certain other book/movie starting with a T... Someone fake-gagged in the theater with me, and I couldn't agree more. Katniss is not a romantic! Stop making her out to be. Stop making these cheesy scenes of touching each other's faces. There is a completely different tension in the romance of the book than the movie. Book: What do I actually feel for you? Movie: You're so sweet that I'm falling in love with you and no longer hesitate about touching or trusting you. And since we're not in Katniss' thoughts, we also don't see how she really feels about Gale, though the implications of how Gale feels are clearly there when they cut back to his face. This was the part was done the BEST. I had a hard time visualizing the outfits Katniss wore--no problem. I had a hard time visualizing the Capitol--no problem. 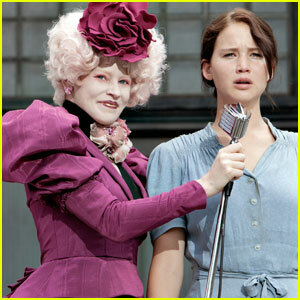 The contrast of District 12 to the Capitol glamour and ridiculous outfits--fan freaking tastic! Special effects? Check. Arena details? Check. Everything about the world building was a win. I really liked the ways they showed us Katniss' commentary. Telling us certain details about the world through Caesar's eyes, Haymitch's conversations with Katniss and how sponsors work, looking into the mind of the Gamemakers, which Katniss usually just speculates about (i.e. driving her toward her enemies)... They did all of these things well. Two things immediately come to mind: the arrow piercing Marvel's throat and Katniss with blood streaming into her eye. One wasn't there, the other wasn't as gory as it was in the book. I can understand why they didn't--they probably wanted to keep the movie PG-13 so that everyone can watch it--but it's sad because that was one of the things I was most looking forward to... Her writing demanded more than what they gave us here in terms of detail. On one hand, you get scenes with President Snow, and he's really creepy and scary and a great villain. On the other hand, they don't do the whole Big Brother thing where Katniss is constantly afraid that they will hear her ranting about them. 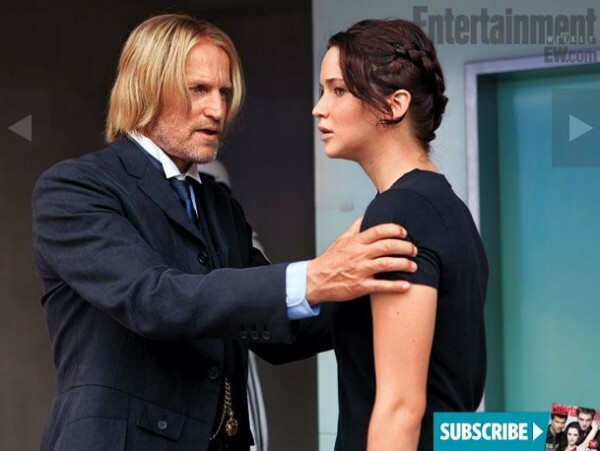 They have Haymitch advising her upfront about her last interview, they have her ranting openly about the Capitol... 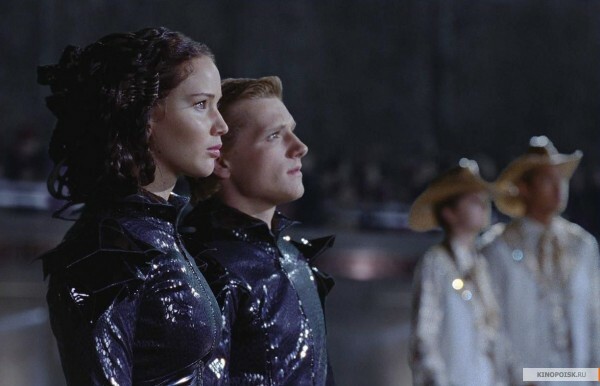 They do show the cameras in the arena but just to prove that the Gamemakers are constantly adjusting to the circumstances of the tributes. 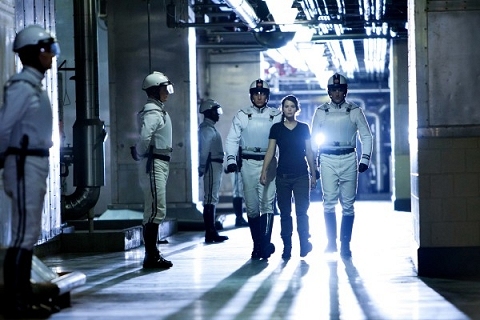 Not to prove that the Capitol is almighty and all powerful. I really liked how they chose to set up the next book/movie by hinting at the idea of a rebellion, putting in the clips about the origins of the first war that caused the Capitol to institute the Hunger Games. That, I think, was done nicely. They also hint at the idea of the love triangle with one of the last scenes of Peeta & Gale & returning to District 12.... In that case, I'm going to hope that the next movie will be better than this one. If you've watched the movie, what do you think? Do you agree or disagree with the points I've made? Also, what did you think of the acting? If you haven't watched it, what are you most excited about? I agree with you on a lot of these (4, 6, 7, 9, 10) and kinda-sorta agree on others (3, 5, 8). As for Katniss becoming more emotional, I feel like that might be mostly because we DON'T get her inner commentary, you know? I feel like there were a lot of times in the book where she was close to tears, but there was so much narration about how she was trying not to show it that you didn't see it. I also feel like Rue's death was still potent just because that's the only time she really broke down. I do agree that the ending wasn't given enough time. And they made it seem like Katniss really was falling for Peeta, when in the book she was still convinced it was an act. And then they never cleared that up at the very end. That goes with 5, too--they didn't show that Katniss didn't really love Peeta at that point, but was just doing it for the Games. And poor Gale. Most of the theater laughed every time they cut back to him. As for the visceral-ness...yeah. I definitely would have preferred more, but they've gotta let the teenyboppers watch it, you know? I think the only reason they did that was for the PG-13 rating and more sales. So far I've seen a couple reviews of the movie and how things in the movie were not exactly like the book. Personally I think a movie and the book should not be compared to each other and more view as two separate things. If I wanted to watch something that was exactly like the book I would just read the book a second time. I like when they change things in the movies so it's not the same...the same would be BORING! I like this, I think you're never going to get the same depth of character in a film as you get book and we've pretty much got to accept that. That being said, Katniss was a bit more emotional in this, I felt her relationship with Peeta was all wrong. I also wasn't that sold on Haymitch...I felt they've toned down all the unpalatable elements to make it more commercially acceptable, which is fine, but sad. I loved all the snapshots they did to make up for lacking Katniss's commentary, like you said they worked really well and the effects and detail was all really good. ending did feel rushed, I don't know why they didn't just make it 15 mins longer...it was hardly a really long film. great review! Nooooo! I hate the Twilight movies for the reasons listed above. I hate to hear that they are trying that with HG! I would have been gagging next to you. About point 3, I think Rue's scene was fine. I appreciated the extra emotion. Err point 4…Oh, my lord, the beginning that would not end. Seriously. The pacing sucked. And yeah, the ending was rushed. I was hoping that Katniss would tell Peeta about it all being fake right then, but she didn't! She just says something about 'forgetting it all' which can be interpreted as 'forgetting the games', and not 'forgetting the games AND the fake relationship.' And finally I agree with points 6-10! I've been holding out on reading the book. After reading your review, I will watch the movie before reading the book. I always get upset after reading a book and then watching the movie adaptation and being disappointed about all the things the movie makers didn't do right. It takes the enjoyment out of watching the movie. Thanks for the insight! @Chessie - I didn't mean the Cato fight scene as the scene where Katniss need comfort from her man--I meant the time when Foxface dies. That was a bit too OOC for me. Right?! Everyone laughed when Gale came on for me too. Finnick. Only if they get an awesome actor to play him :D.
@Rebs - me too! I think the movie is an art form separate from a book but that it should keep the essence of the book. For me that means keeping the characters the way they are---like what TVD did. It changed what happened but it kept the characters as layered as they were in the books. @Cait - definitely toned down the unpalatable elements. Definitely sad :( but understandable. @Amy - It's not the extra emotion that bothered me about Rue's death. It was the fact that Katniss ducked vs. came there too late. For me, the former seems instinctual, less tragic, less symbolic of the games themselves. @Maria - Right? Reading books after seeing the movie always makes me feel better about the movie adaptations than doing it the other way around. 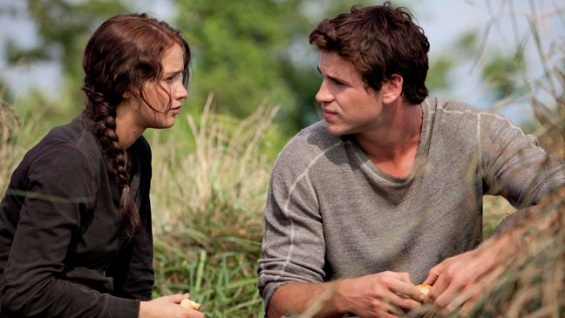 I also believe that the movie leaves us thinking Katniss does love Peeta but feels sorry for Gale. In the books, though, Katniss has no idea who she will come to love, only knowing that she isn't in love with either of them by the end of the games. I was very upset that she didn't have to break the news to Peeta that she wasn't in love with him. The whole way they portrayed the romance in the movie was way to close to the Twilight romance style.